The Presbyterian Church Property Trust has reportedly paid more than $15 million for a circa 6000 square metre beach front site, which includes the iconic Primrose House at Dolls Point on Botany Bay. Savills Director Residential Site Sales Stuart Cox who, with colleagues Neil Cooke and Johnathon Broome, managed the marketing campaign on behalf of vendor, Government Property NSW. Mr Cox said the church managed to inch out a range of other interested buyers including function and wedding venue operators, high net worth individuals looking to restore the existing home to its former glory, residential developers, child care operators, hotel operators and schools. 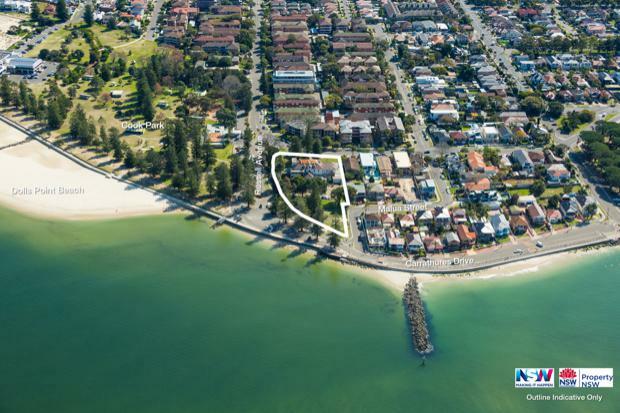 "Rarely does a circa 6000 square metre parcel of beachfront land situated within such close proximity to the Sydney CBD and all local amenities, get offered to the market," he said. "This was one of those rare occasions and the market response was predictably enormous with the purchaser paying well above expectations. "Located at 190 Russell Avenue at Dolls Point, in Sydney’s South, the site, which includes the iconic, heritage listed, Primrose House, is zoned R2 Low Density Residential and part RE1 Public Recreation. Property NSW Executive Director of Commercial Transactions Dennis Szabo said The Presbyterian Church Property Trust was the standout bidder due to the combination of price and its commitment to preserving and enhancing the property’s unique history. "We encouraged prospective purchasers to consider how they could preserve the heritage significance of the site, and options for its adaptive re-use,’’ Mr Szabo said. He said securing a purchaser that was committed to preserving and enhancing the heritage of the site was a real win for the local community. Primrose House was built in 1891 and used as a hospital for the war wounded from 1913 to 1936. It operated briefly as a private boys’ school in the 1930s, before it was sold to St George Hospital in 1936. Mr Szabo claimed the proceeds from the sale will be redirected to better infrastructure or improved service delivery.